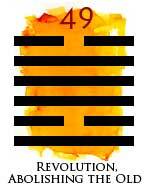 Long ago, when the ancient I Ching oracle was consulted about my purpose here on earth, the response was Hexagram 49 – Fire in the Lake – Revolution(straight up, no changing lines). Over the years, I’ve periodically refreshed my memory on the meaning of this hexagram. I was always digging for the deeper meaning… trying to find out how it related to me. It wasn’t until recently, while soul-searching about writing this blog, that it all clicked. Simply put this hexagram describes a particular point in the cycle of life when peace has bubbled into chaos. Similar to what happens to water molecules that have begun to boil. There is conflict… there is “Fire in the Lake.” When this boiling point… this chaos reaches a critical mass, there is radical change and a metamorphosis. There is a purging of the old and a rebirth and this is a revolution of the body, mind and spirit. These changes are mostly internal, unseen and quite possibly disbelieved until the change/metamorphosis is complete… (think butterfly). On the up side, the hexagram predicts success as long as there is perseverance and faith to keep on the path until completion. Not only is this the story of my life… but I seem to have created a career out of helping people destined for revolution themselves. This blog is about REVOLUTION! My r(evolution), your r(evolution) and our r(evolution). It’s about a revolution in the way we think, the way we behave and the way see we ourselves and the world around us.